Ericsson's market share for mobile network equipment declined from 38% in 2011 to 35% in 2012, according to figures released by the company. The company's share of the overall network equipment market also declined from 27% in 2011 to 24% in 2012. However, Ericsson's presence in Global Services increased in 2012, as the company now puts is share in this category at 13%, a strong lead over the nearest competitor. After the acquisition of Telcordia, consolidated as of January 2012, Ericsson also has a leading position in the OSS and BSS market. Ericsson said its market share decline in mobile network equipment is due in part to the ongoing technology shift in China, where investments are moving from GSM to other technology areas where Ericsson has limited presence. Ericsson maintained its share of the global installed base of radio base stations at 40%. Ericsson also noted that its market share for LTE is twice as big as the largest competitor, measured in shipments for the full year 2012. Some other notes from Ericsson's newly released 2012 Annual Report. 40% of the world’s mobile traffic runs through Ericsson-supplied networks. Ericsson now has over 110,000 employees, including 60,000 services professionals globally. 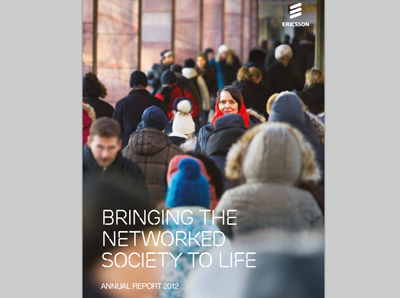 Ericsson currently manages networks with approximately 950 million subscribers. Total mobile data traffic is expected to grow by 12 times between 2012 and 2018. Mobile broadband now accounts for approximately 25% of all mobile subscriptions. Amazon Web Services is cutting the price of its DynamoDB, a fully managed NoSQL database service. The price of indexed data storage has decreased by up to 75% in all AWS regions. The price of provisioned throughput capacity has decreased by up to 35%. AWS is also enhancing the service with a new Reserved Capacity option that offers significant savings over the normal price of DynamoDB provisioned throughput capacity. Purchasing Reserved Capacity incurs a one-time upfront fee and a commitment to paying for a minimum usage level, but offers up to 53% savings. Google and MPEG LA reached a deal granting Google a license to techniques that may be essential to VP8 and earlier generation VPx video compression technologies under patents owned by 11 patent holders. The agreements also grant Google the right to sublicense those techniques to any user of VP8, whether the VP8 implementation is by Google or another entity. It further provides for sublicensing those VP8 techniques in one next-generation VPx video codec. MPEG LA said it now will discontinue its effort to form a VP8 patent pool.